There’s a sad, but true, statistic that every entrepreneur knows by heart: 9 out of 10 startups fail. Unfortunately, PatternBuilders is adding its number to this pile. We have been procrastinating writing this post because shutting down a company is hard. When you put your heart and soul into something, you need time to process, reflect, and eventually get to the point where you can move on. But moving on does not mean that we are disappearing; after all, shutting down the company does not end our passion for big data, privacy, and all things tech-related (especially IoT). To that end, we will be maintaining this blog, as our main place to write and comment about those issues. We are also consulting around all areas involving big data and/or privacy (via our existing consulting organization, Ludloff-Craig Associates) and are working on some other things that we are keeping under wraps for now. But if you follow our blog, @terencecraig, or @mludloff, you will be the first to know. And if you have interesting opportunities, consulting projects, or for the right company – a full-time job ­– please get in touch. There are a number of reasons why we are shutting our doors, but suffice to say, we made some decisions we knew might have an adverse effect on the company. And we stand by those decisions. During the past two years, we found ourselves dealing with a number of unanticipated health issues. Terence’s mother was paralyzed and in the ICU for almost 18 months which led to him taking a leave of absence. Happily, his mom is fully recovered and it’s our hope that she will be around for many years to come. The extended leave of absence of a co-founder and CTO for any startup would be bad. But the impact on PatternBuilders was compounded by our second decision point: not spending a lot of time pursuing venture money. We had good technology, better prospects, and a partnership with Microsoft. Why not continue to bootstrap the company? As we began to work with our betas, the technical advantages of our solution being built for streaming analytics on the cloud had us hoping for a big win. But with Terence out and another executive falling ill, there was simply not enough money to hire quality folks quickly. Even with that, we considered restarting the company: Our customer and partners were being amazingly patient so why not push forward? This leads us to our final decision point, the rise of Spark, “a fast, general engine for large-scale data processing.” We believe that this is a game-changer as Spark has addressed most of the problems that prevented the Hadoop ecosystem from being broadly adopted. And as a well-supported open source project, our prediction is that Spark is going to make it incredibly difficult for closed source software like ours to compete in the big data space. When combined with an over-saturated, hyped market and the dramatic rise in OSS quality driven by Apache and (gasp) Microsoft, it’s not clear to us how any pure play big data vendor creates the next Oracle. No ETL issues to deal with. SaaS vendors have already captured customers’ data. Hosted service offerings. SaaS customers do not have to deal with the “big data analytics” infrastructure burden. Existing infrastructures. SaaS vendors have the expertise and capital to build and deploy resilient scalable infrastructures. And there you have it. When we looked at our options, we knew that it was time to shut the company down. Humility—you can’t always “win” in the winner take all mentality of the valley but when you do win after “failing,” you realize that it has a lot to do with your team and with luck. We’ve met a lot of smart people, some even geniuses, but the smartest people are those that are humble about their successes. These are also the people we try to surround ourselves with. Compassion—there is nothing harder than having to “let good people go.” But we have always tried to ensure that our good people landed softly. This is much easier to accomplish in the boom times but we are happy to say that we did our best in the bust times as well. Introspection—entrepreneurs are always thinking about better ways to do things. That’s usually what forms the kernel of the next great company. We’re not bitter or disappointed because our next great idea may be born out of our last failure. There are many people, partners, advisors, and customers that supported us along the way. We want to publicly thank all of them for their ongoing support as we built PatternBuilders and then tried to work through keeping it going. They stayed with us during Terence’s leave of absence as well as the subsequent product delays and for that we are truly grateful. We also appreciate their counsel as we dealt with the tough decision to shut down PatternBuilders. As shut downs go (and we’ve been through a few), the process was much easier due to all of them. Thank you and we hope to pay it forward. There are lots of lists about what makes great entrepreneurs or startups but there’s usually one thing those lists have in common: Not afraid to fail. If you are an entrepreneur, you are a risk taker. If you are afraid to takes risks, do not be an entrepreneur. Failures are a fact of entrepreneurial life but out of those failures, great things can happen. As we said earlier, we are keeping the conversation going on our blog and twitter handles. Please keep in touch! Entry filed under: General Business. Tags: analytic systems, big data, Hadoop, streaming analytics, Technology. I am sure you would never have given up an opportunity to live this dream. The right thing to do is to follow your passion and do what is right for you. 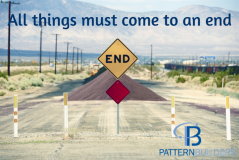 I don’t feel you would have ever been satisfied with yourselves if you did not develop Patternbuilders. You are entrepreneurs at heart and therefore you needed to do this. It was a privilege to be asked to engage with the two of you. The best of luck and I am sure you both will be back doing great things in the technology world. There is no failure and equally there is no success. A very wise man that I know exposed me to eastern philosophy when I was a young man; my ongoing studies thereof have taught me this truth. And as you’ve so eloquently put it in this post, this is just the point of entry into your next phase — a likely source of your next big idea — another opportunity to manifest your belief in continuous, daily improvement. The problem with the world is the notion that “success” is a destination to which one arrives. It’s also the source of my only disagreement with the post — Big Data may not be a product, but it is certainly more than a “feature.” Here’s why: deep knowledge of verticals and all the infrastructure in the world cannot ensure insight, let alone ‘actionable’ insight, or at least it has not had this meaning in the context of the companies you’ve listed among those ‘ahead of the curve’. In CRM, sure there are structural advantages in managing and automating inputs of contact info and notes about prospects to whom you’ve spoken, but how close are all of the years we’ve had to use this technology and its infrastructure (selling for $500K annually, in some cases) brought us to a yield of perfectly timed, predetermined sales or business development calls with measurable/predictable probability of wins and revenues? These technologies have not brought us close to this at all — they’ve just given us a data point with which to more credibly assume an effect, without any means to attribute cause. So I’d say they’ve brought us into maybe… galactic range of a truly insightful “Big Data Technology.” Point being, PatternBuilders the company may be making an exit, but it will never be gone. The ideals behind PBI’s ideas are a next-step in the Big Data evolution — when we finally stop taking for granted that having tech for the sake of having tech is far less valuable than having ingenious partners and true insight. Congratulations you guys — I can’t wait to see what’s next!! !